Evo & Grace: The WanderLusts: Experiencing Dinner In The Dark at Residence Inn in Tagaytay. Experiencing Dinner In The Dark at Residence Inn in Tagaytay. RESIDENCE INN in Tagaytay City did a good job in hosting the fast rising one of a kind experience Dinner in the dark (Black Dinner), a much talk awareness campaign challenge for the benefit of people who are blind. 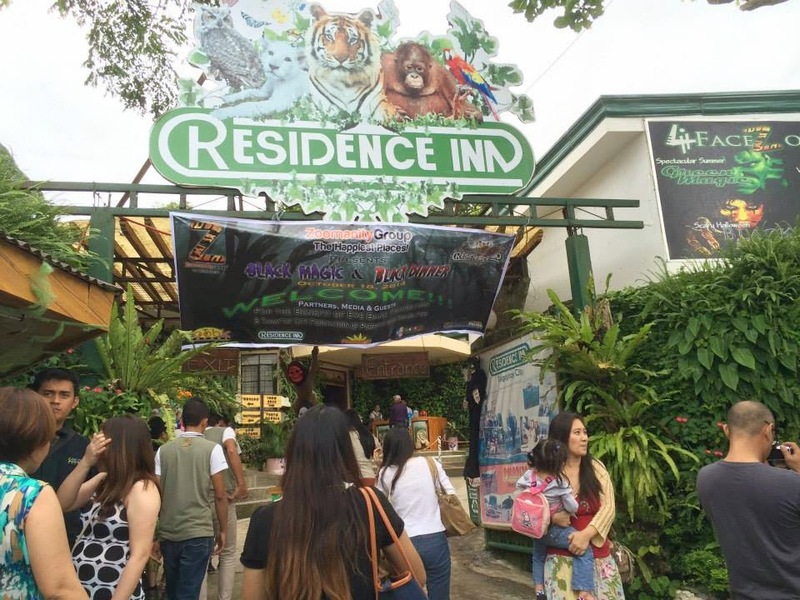 In the event last Oct 18, 2014 we are fortunate to be invited among other bloggers to experience the so called realization dinner plus the tour of Zoomanity park inside Residence Inn, wherein they house variety of foreign wildlife animals, fishes, snakes and birds. Before the scheduled dinner there is an orientation coming from the organizers, a talk from Dra. Frances Roa of Eye Bank Foundation who encourage everyone to be a cornea donor and how we can change lives. Criselda Valderama, a volunteer lady with eye sight defects is the one who discuss to us how we can survive eating without any lights at all. She inform us that a waiter/waitress like her will assists us and will give instructions how to locate utensils and food in the dining table, the instruction will be useful only using a clock method depending where we are facing, like the front is 12 0’clock next is 3’0’clock to the 6 and to 9’0’clock direction. Cellphones and glittering accessories is not allowed inside the dark hall. Next step is we are blindfolded in a line where we enter a total pitch black function room, the waitress assign assist us one-by-one to our designated chair. Then we are told to remove our blindfold and to our surprise it is so dark that you can’t even see a single light. Then the usual dinner start using only the sense of touch and taste. I admit I give up using spoon and fork and use my bare hands to consume the serve food on my plate. During the almost 45mins of eating in the dark, I realize that there are a lot of things that need to be thanks and praise of, I cannot imagine losing your sense to see and survive eating in that situation. Somehow I feel fascinated and move on how blind people live day by day on that kind of survival. Of course we know how does it feel but it is more felt when you experience it, when you yourself tried eating or walk like them. I salute Residence Inn for this kind of event. I immediately called some event organizer friends I have and told them this wonderful experience that they need to re-do it so majority will appreciate those blessings they have and stop complaining for those petty matters they always get irritated of. Our meal in the dark. After the dinner we proceed to the theater hall of Residence Inn wherein the next show is about to start, the Black Magic performance featuring their in-house talents. Dinner in the Dark is part of the BIG “O”wesome October of Zoomanity Group who own the Zoomanity Parks inside Residence Inn, they also have this event in Zoobic Safari in Subic and in Misono Restaurant in Makati. The event proceeds goes to Eye Bank Foundation in cooperation with Person With Disabilty Federation of Tagaytay City. Aside from Zoomanity Park in Tagaytay, Zoobic Safari in Subic, Zoomanity Group also own and managed Zoocobia in Clark Pampanga, Paradizoo in Mendez Cavite, and the newly establish Zoocolate Thrills in Loboc, Bohol. You can enjoy Zoomanity Parks and get discounts and freebies by liking Zoomanity Group’s official facebook fan page at www.facebook.com/zoomanitygroup. Or call Tel Nos. 899-9595 loc 344 or email zoomanityg@gmail.com and visit their website at www.zoomanity.com.ph . Ready to welcome the guest. The view of Taal Volcano from Residence Inn. Dra. Frances Roa of Eye Bank Foundation . The cast and guest of Black Magic show in Residence Inn. I;ve heard of dinner in the dark, but I am not sure if they have ever done anything like it here in Boston. It's definitely not for me because I am a picky eater, but it's an interesting idea. It's a different kind of activity, which I would like to try myself. I also find it to be for a good cause. Sounds like such a fun concept dinner in the dark. I'm so picky when it comes to my food though that I don't know if I'd thoroughly enjoy it. Great concept! I'd love to attend something like this. I love trying new things especially with my husband. Eating in the dark would help you appreciate your other senses, but I bet you got to focus on the taste of the food! I'm glad you had an enjoyable time. Wow that looks like a great play to eat. Looks really unique and fun. Looks like it was so much fun! Haha! 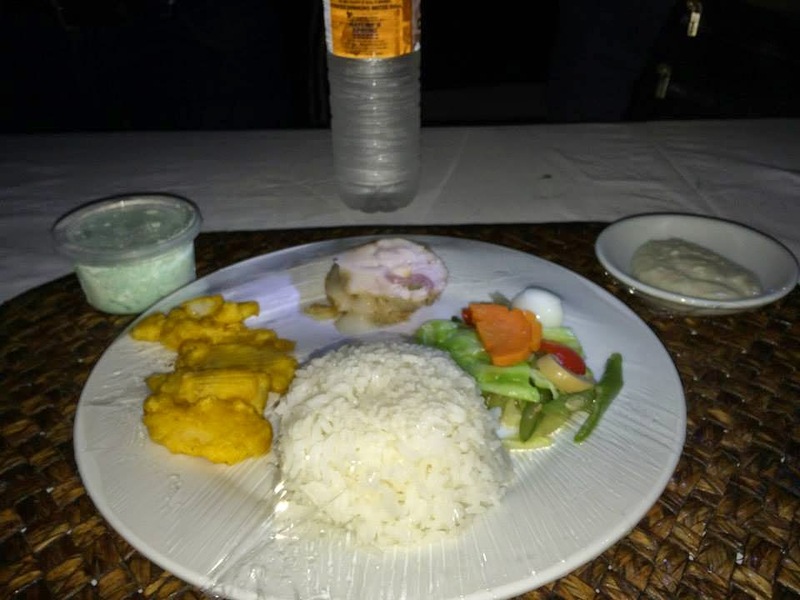 I don't think I have been there before..
Carmen Perez says: I have never heard of Dinner in the Dark. Not sure any restaurant here in Miami offers that? Somethign new to try. What a great event! Our family raised seeing-eye dogs for a number of years, and we had events like this to help raisers better understand the challenges the recipients of these pups were faced with. We were able to see the benefit these pups offered their companions in many ways. This looks like such an incredible experience! I feel so thankful for my sight right now. Dining in darkness sounds interesting. Also, what a great cause. wow i would say another place in tagaytay to check on when we get the chance to visit the place. Never of dinner in the dark but i think its a great experience to see and understand how the blind feel as well as how they deal with it. Wow, what a cool experience. Although this chicken here would not have survived! Dinner in the dark! That would be so much fun.Something that would really wake up your senses! That's definitely something interesting. I haven't heard of it before. That sounds like a great experience. As a foodie I'd enjoy the experience. It would really make you think about somethings that you'd take for granted. This sounds like an experience maybe we should all go through at one time or another in our life. I have heard of these experiences and I would hope to do this some day. We all should be aware that we do have so much to be grateful for and we should take advantage of them. Thanks for sharing. I think that would have been an awesome experience. I love that you were blindfolded and that the whole dinner was in the dark. My father lost his eyesight a few years before he died and it changed his world dramatically. Very touching post. Very cool idea. I certainly wasn't expecting the tiger to be there. The tiger is beautiful. I've heard of different 'Dining in the Dark' experiences...but I'm not brave enough to try it though. I like to see what I am eating. This would be a great event to go to. I have heard of the eating in the dark experience and think it would be fun. I bet the food would taste so good. What a cool experience. I would've loved this! Wow, this sounds like a wonderful thing to get to experience. Thanks for sharing, I would love to partake in something like this one day. I can only imagine how impactful that experience would have been. What an interesting opportunity. LOL on giving up the utensils! I bet it was a cool experience. I totally don't blame you on giving up the utensils! LOL! This just sounds so interesting. Here we have a restaurant where you're not blindfolded but the whole place is pitch black so you can't see anything, even if you wanted to. The idea is to feel like a blind person does. The whole staff is blind too so you know they'll guide you safely! I've heard of dinners like this & think that it sounds like an amazing thought provoking experience. And I think it's pretty cool that they plated the dinner so wonderfully considering that they had you eating in the dark. How amazing! I just can't imagine being blind folded to eat a meal, but what a perpesctive! This looks SOOOOO fun and I love the little things they've done to make it funner. Dinner in the dark?? Yes Please! I can handle it! That would be so cool to try! I had never heard of that before!